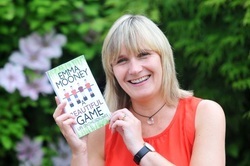 Welcome to the website of Emma Mooney, author and writer of Scottish contemporary fiction. Emma's novels are available to order in paperback from all good online sellers or you can download them on Kindle and start reading straightaway. Read the full Sunday Mail article and find out all about the inspiration behind A Beautiful Game here. You'll find points for discussion at the back of the book. If you'd like Emma to visit your book group or meet up virtually then please get in touch through the contact page. Emma is a qualified primary school teacher with over twenty years experience. She enjoys talking to students of all ages, including secondary pupils. She is happy to do readings, poetry sessions or inspirational talks. Please get in touch through the contact page.